I came out of my room this morning, wrapping myself up in my soft red robe. It was 6:20 and the schoolbus would be arriving within the next 15 minutes or so. I found Grace on the couch, finishing up her homework with her Madrigal dress next to her ready to take to school for a performance. “Did you eat anything yet?” I asked. “No.” I handed her an apple. Ethan needed me to write a check for a school skiing trip and I gave David a kiss on the cheek as he ate the rest of his breakfast. Very soon this peaceful moment would be over. David recently found the TV series, “Top Shot” on Netflix and has been watching it every chance he gets. It has inspired him. In case you haven’t seen it, it’s a competition type show with a group of people trying to be “top shot”…they spend all their time shooting guns and arrows at targets. In every episode, someone has to leave the show so that eventually there is only ONE winner…..the TOP SHOT. David won’t be watching it today. David will be having a talk with Mom and Dad. The upstairs was out of toilet paper. Sarah needed some. The bus still hadn’t arrived for the teenagers. After helping Sarah I went back downstairs just in time to find THICK, DARK BLUE, BALL POINT PEN INK shoot out of David’s hand. It could have been much much worse. He can thank his lucky stars that it miraculously DID NOT go on the leather couch or the rug. Instead, it was dribbled all over the floor and the kitchen island. Acting quickly, while screeching, I grabbed paper towels. Those of you with experience will know that ink isn’t the most pleasant of liquids to clean up. Raw egg is bad…..ink is far worse. At first wipe, the ink drop will turn into a horrifying ink smear. 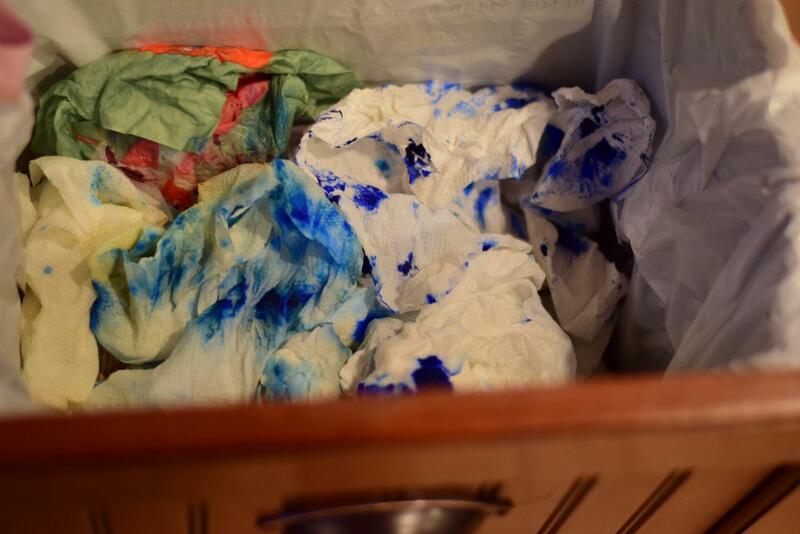 Turning the paper towel to a white side and wiping yet again, it will then turn it into a lighter blue smear. And thus the action is repeated, to be finished up with a shake of BAR KEEPERS FRIEND, and a prayer offered up in gratitude that THAT ink drop came off the wooden floor/island. Then, off to clean up the next one. My finger tips are still currently stained a pale, deathly blue. “All that pen wanted was to be turned into a book.” said Grace, looking on from the door. “If only David felt the same way.” I replied. So, how did this happen? After many confusing moments and much questioning, I finally figured it out. To do this, he must take a perfectly good ball point pen and take it all apart, causing it to never more be useful as a pen. But wait! It will soon be even BETTER than a pen! 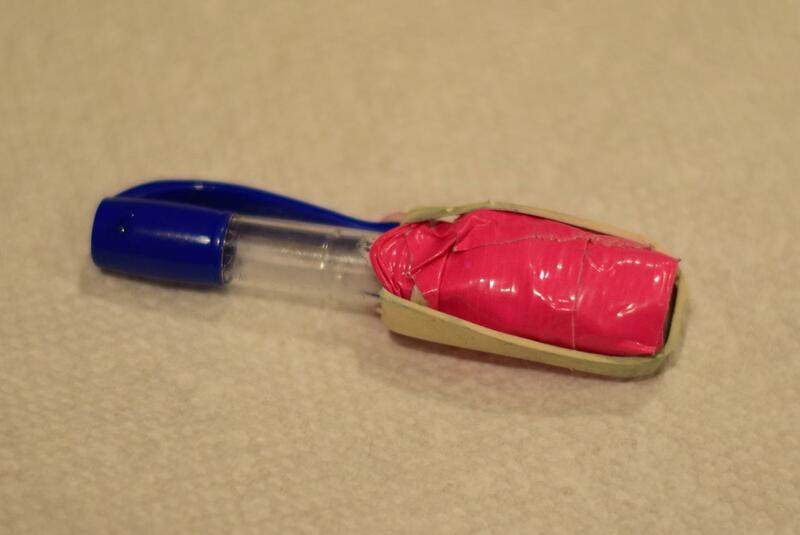 For then, he wraps a rubber band with duck tape around the pen. It is now a shooting device. Hmmmmmmmmmmm, What to shoot? THE INK CARTRIDGE that used to be inside the pen, of course! After all, it is thin and has a sharp point on the end, just like an ARROW!!!! Genius. What David learned today was that the ink cartridge MAY explode as you shoot it! “I’ll have to put glue on the end next time” I heard him say to himself as he helped clean up the ink. The bus came. The bus went. Goodbye E, Goodbye Grace, Goodbye David. Deep breath. Now it was time to get the elementary kids ready for THEIR bus. I went downstairs to wake up the boys, amazed that they slept though the excitement. Seth did say he had heard me say something. “What did I say?” I asked expectantly. “You said, ‘I’m so sorry I did that. '” “THAT. is NOT what I said,” I replied. (and David didn’t say it, either) He must have been dreaming. 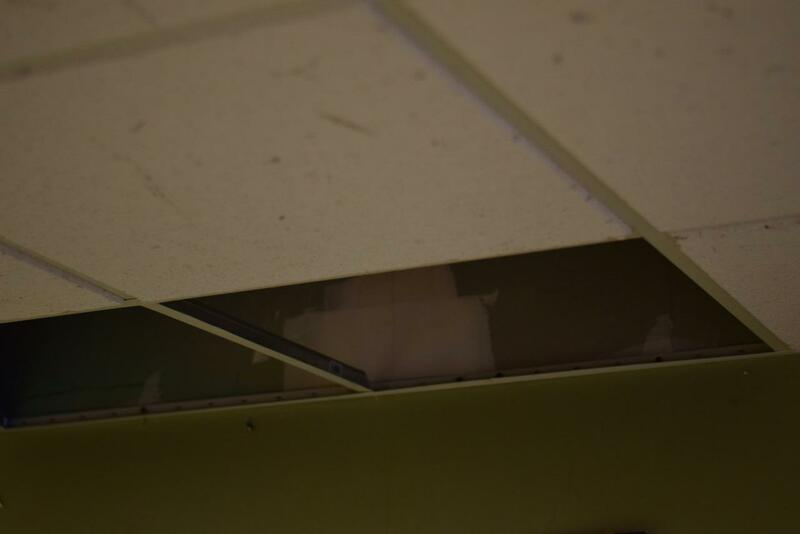 The “TOP SHOT” story isn’t over yet….because guess what I discovered downstairs? Uh oh. 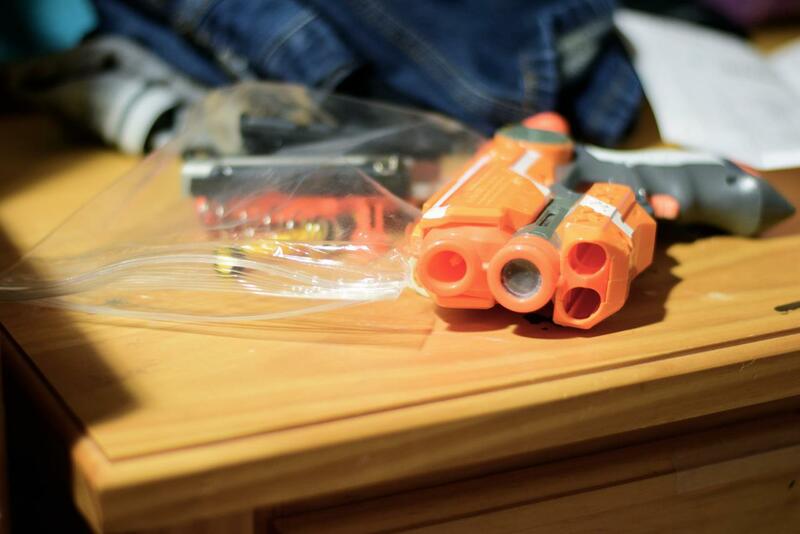 I also found the workings of a modified Nerf gun in progress on his dresser. The baggie to the left of the gun is filled with parts that used to be INSIDE the gun. This is what the inside of our kitchen trash currently looks like. My child is a creative, busy, bright, single minded, scientist-type and I’m forever being impressed, delighted, and amused over his endless projects and interests. But he still has to learn his limits. This entry was posted in life with boys and tagged david, funny, large family by Shanda. Bookmark the permalink. I hear you! I also know that as a mom I tend to get all worked up…I guess I just caution to calm down a bit and make sure you hear anything your husband has to say about what all to say/do about the situation….sometimes those dads who used to be boys can give some calming advice, or reach the boy’s heart better than a mother who doesn’t understand that urge to shoot at things…and you could read lifeintheshoe at dorcassmucker.blogspot and see what she had to say in her “Letter from Harrisburg Dec. 2015” to get a bit of perspective (which you already have with your 19 years of experience) Peace to you today! Wow! You certainly do have your hands full! I am glad the ink came off everything, and I pray God will give you wisdom to know how hard to be on your little Einstein! 🙂 Respect others. Respect the belongings of others. Respect yourself. Those were the rules I used when I was a school teacher. They fit a lot of things that happen! OH MY WORD!!!! if that doesn’t sound like my 10 yr old!!! Always taking something apart to make something else!!! Wonder how many swords we have around here!!!! Duct tape is used for everything!!! LOL at Grace’s comment. 🙂 Love it. Well, at least you can say that your life is not dull! 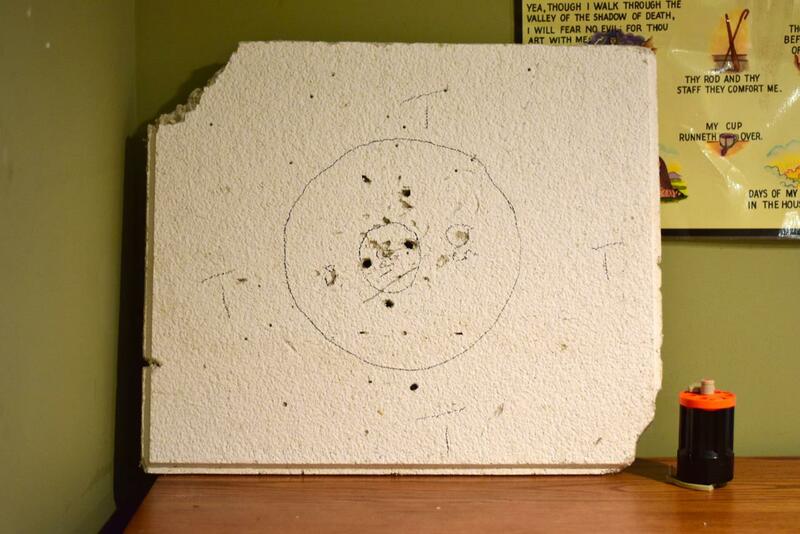 When my 40 something son was a young teenager I found holes in his bedroom walls of our old house. He was throwing those metal star thingies. Now he has his own dojo, has traveled to Japan several times for training, and has a 10th degree black belt. He combines his training at the dojo with witnessing to his students. So you never know. When I first saw the photo that accompanied the link on Facebook, I thought the ink had spread throughout your entire load of laundry. Glad you didn’t go through that (said from experience after one of my kids sent a ballpoint pen through the washing machine). Might want to ask dad about the time grampa came home and found him on the buldoser, on the neighbors property, building a racetrack!